Teachers working together for the See, Run, Do activity that taught about the various forms of energy. Photos by Carrie Searcy. 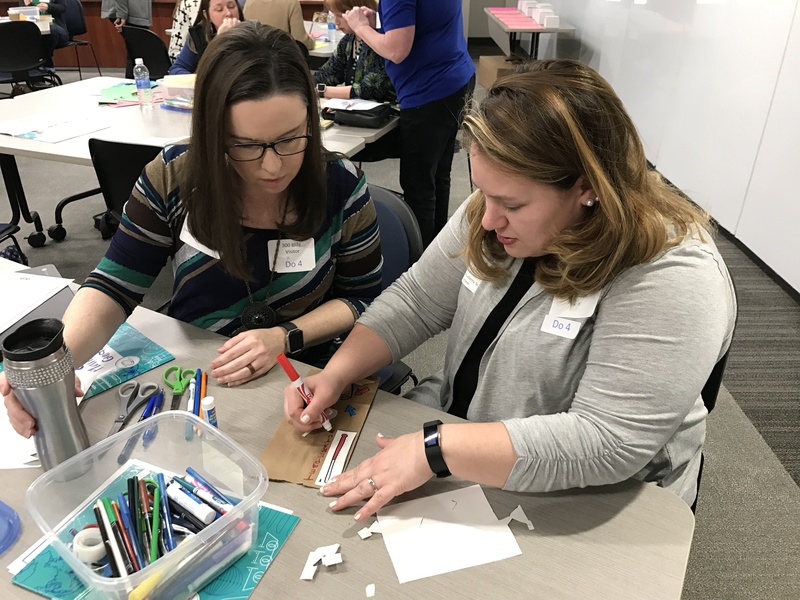 The Kentucky Department for Energy Development and Independence (DEDI) on Feb 21 partnered with the Kentucky NEED (National Energy Education Development) Project on the second of the four workshops to bring grade-appropriate activities about energy to 21 teachers in grades K through 12. The workshops are being held for educators who want to learn more about energy and the resources available through NEED in a hands-on environment. Participants came to the Energy and Environment Cabinet (EEC) building at 300 Sower Boulevard to participate in Kentucky Academic Standards-aligned activities that covered forms and sources of energy, energy transformations and more. The interactive sessions included NEED curriculum activities for students in all age groups. This partnership, which began more than 20 years ago, is made possible through a grant from Coal Education awarded to the Kentucky NEED Project. It provides energy education curriculum that is interdisciplinary and encourages attendance by not only science teachers, but also teachers of language arts, math and/or social studies. The Coal Education Grant makes it possible for teachers to attend free of charge, receive copies of NEED’s energy curricula including the new Coal Education suite, and substitute teacher costs to the school districts. The activities were held at the Kentucky Energy and Environment Cabinet, 300 Sower Boulevard, Frankfort. And the exercises themselves looked nothing short of fun either for kids or adults. One learning activity called See, Run Do, taught participants about the various forms of energy, the transformation of energy and communication skills teachers could use. Participants were split into three groups: one to see, another to run and a third to do. In the exercise, the seers relayed what they saw to the runners, who then gave their interpretation to the doers. The result was somewhat comical, through interactive teamwork, the dual purpose activity not only taught a lesson, it did so in a fun way that would be relatable way to kids and would reinforce learning. New to NEED’s suite of materials this year is coal curriculum—a three-title collection of guides for Primary/Elementary, Intermediate, and Secondary students. This new addition to energy education addresses coal formation and chemical properties, coal mining, the uses of coal, its role as an energy source and the environmental concerns associated with the use of coal. The Kentucky National Energy Education Development (NEED) Project is the state program of the National NEED Project, a not-for-profit education association that focuses on K-12 energy education. NEED provides workshops for teachers, grade-appropriate curriculum materials and kits for energy activities in the classroom. NEED also assists schools in forming student energy teams that study how energy is used in the schools and implements programs to help reduce energy consumption. If you are interested in attending a future Kentucky NEED Workshop, you may contact Karen Reagor by phone at 859-802-2024, or by email at kreagor@need.org.